I started this--the top part with the pier made of 80/20 Series 15 T-Slot Aluminum beams and angles--about a year ago, or maybe longer. I never really used it though, because I needed some place level to anchor it. Taking some more t-slot beams I made a base for some super-duty castors and bolted an old steel AV Cart cabinet to it. 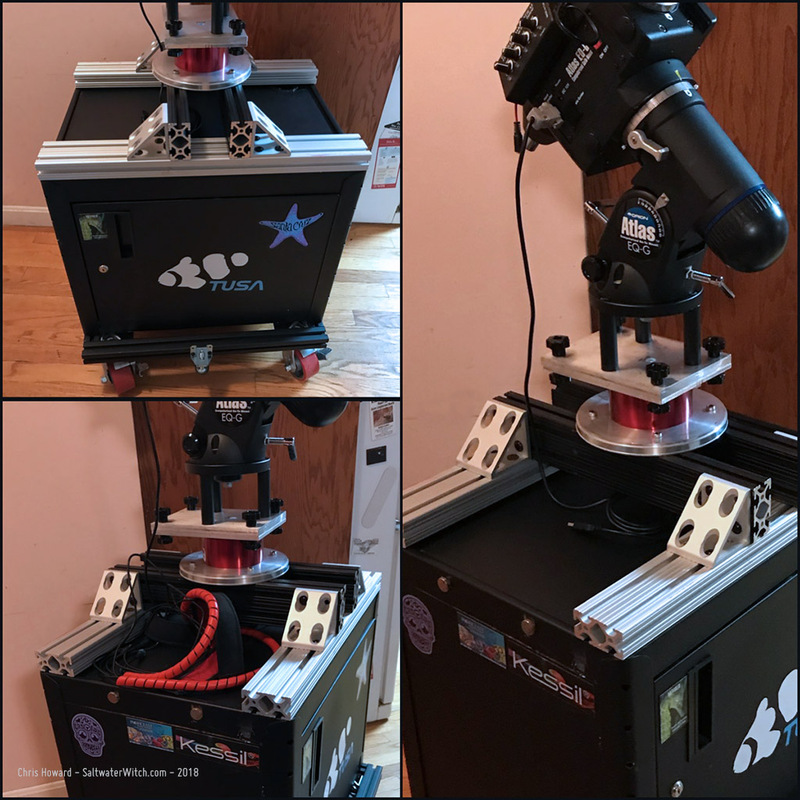 This has become the base for my next set of astro sessions, where I will be wheeling this out to the driveway, leveling it (threaded leveling adjustments on each side), polar aligning, and then we'll see how the astro imaging goes. I'm looking forward to getting more of the western sky, most of which is blocked by the house when I'm shooting from the backyard. According to several weather sources it's not going to be clear after 8pm tonight, but I set up the William Optics GT81 anyway. Two reasons: I need to test out an adjustment I made in the spacing from the WO FLAT 6AII, to see if it corrects some star elongation at the corners--I added a 3mm M48 spacer just between the flattener/reducer and the off-axis guider. Second, I'm testing out some plans I have with Stellarmate (INDI, Ekos, KStars) on a Rasp Pi 3B+ (faster, with AC wifi). 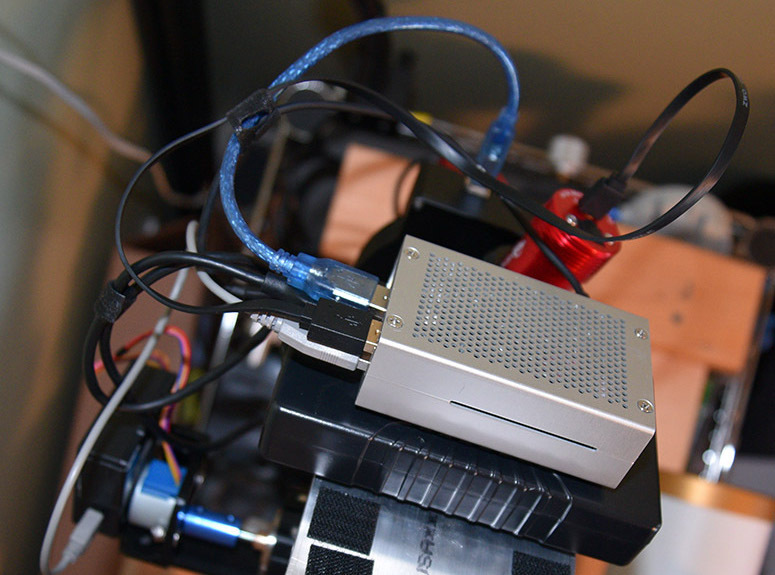 This one will be dedicated to this color imaging rig, with an auto-starting Ekos equipment profile. 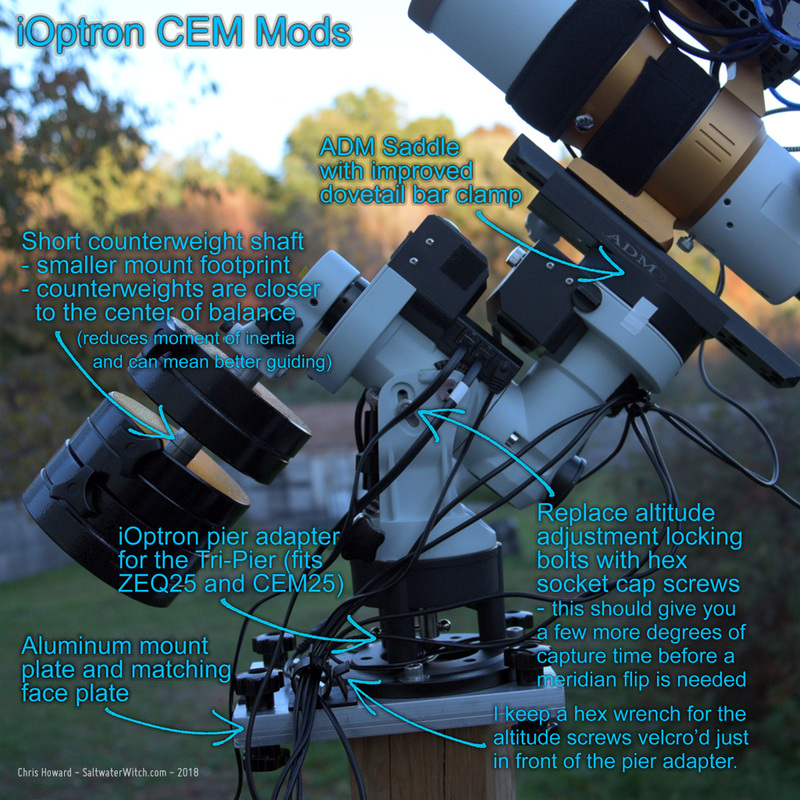 I put together a list of modifications and upgrades I have added or built for my IOptron CEM25P mount, and included them in one handy image--with arrows and descriptions (see below). 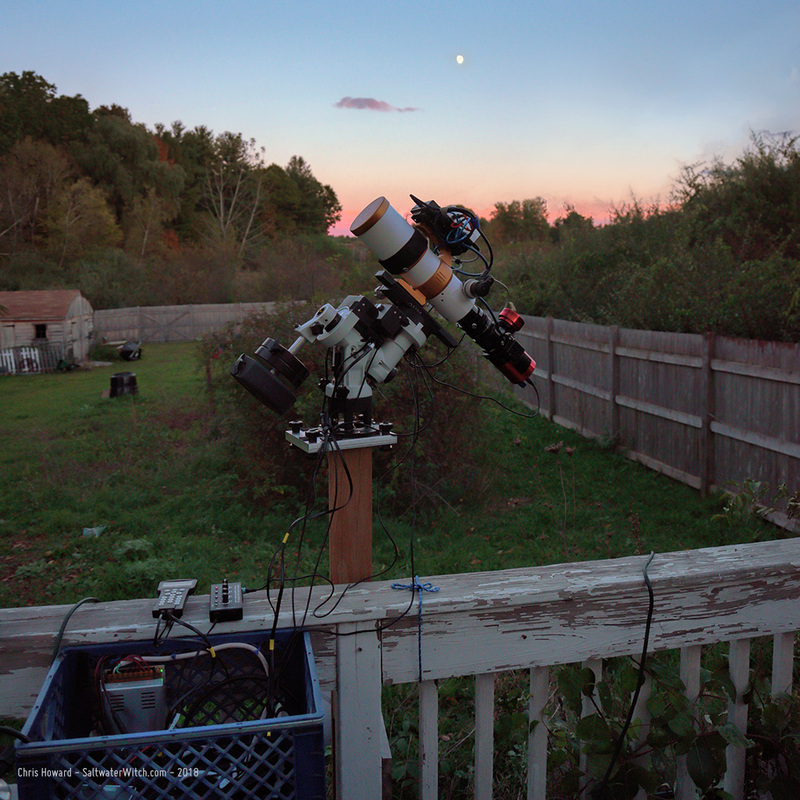 Over the last year this has become my primary telescope mount (over my Orion Atlas EQ-G), partly because I've been doing most of my astro-imaging work with 81 and 61mm aperture refractors (that's a William Optics GT81 in the upper right). The other advantage of the CEM25P is quick setup time. I can have this bolted to the pier plate, polar aligned, and ready to image in about five minutes. 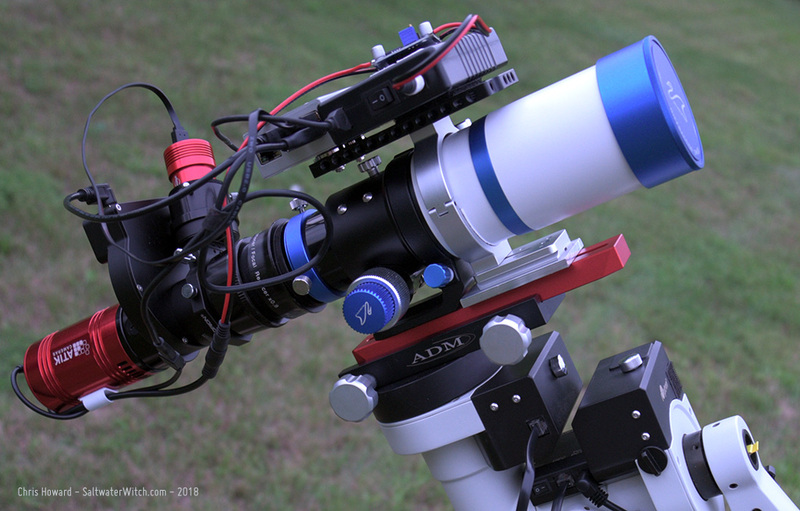 There were several high-quality 60mm apochromatic refractors that entered the market last year. 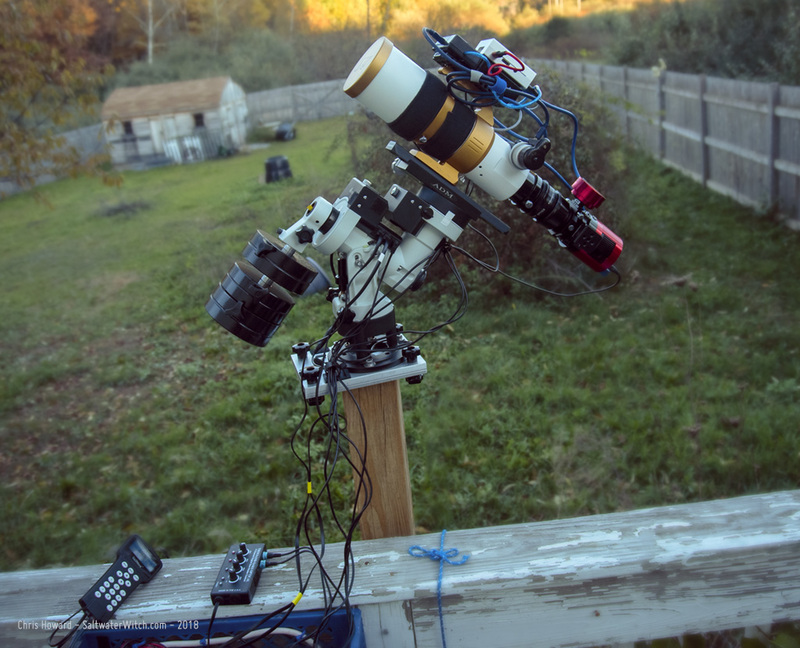 They were pitched as portable wide-field scopes, and also marketed here in the US for the solar eclipse last summer. 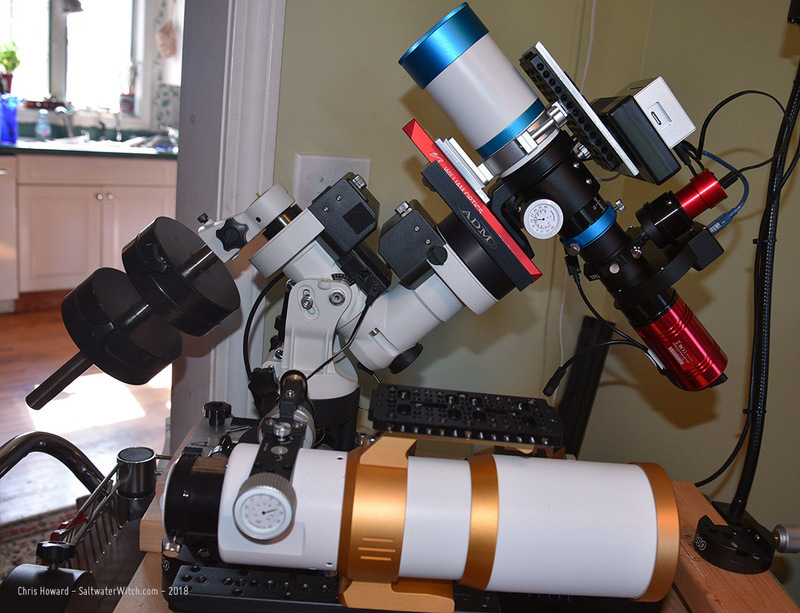 Starting around $450 USD, these little refractors, like the William Optics ZenithStar 61 sold out quickly. I didn’t get a chance to purchase one until May of this year. The ZS61 has a 360mm focal length at f/5.9, synthetic fluorite objective lens--FPL-53, which has some amazing optical properties. It’s a great scope, with a solid focuser. But there’s an easy modification that will make it even better. I found one thing when I added the imaging train--here’s my narrowband setup, with an Atik414EX monochrome CCD, a ZWO filter wheel with 5 filters, hydrogen-alpha, oxygen3, sulfur2, clear, and a near IR 685nm longpass. With the field flattener this ends up around 3.2 pounds or 1.45kg. These scopes--I keep saying these scopes because there are several varieties of the same basic components, a few of them with the same focuser, focal length, and aperture, differing--as far as I can tell--only with the hardware, knobs, lens caps. Anyway, the first thing you probably want to do with these is strengthen the scope’s connection to the dovetail bar. The stock version comes with this clamshell ring and shoe, and if you’re going to do anything other than some light visual astronomy, you will want to backup the stock ring with another. I found that when I added the camera, filter wheel, and guider, the whole system had a slight flex to it if I lifted or pushed down with the camera. At first I thought it was the focuser and was a bit bummed about that, but then I noticed it was the whole scope moving, and it all relied on this rather slender ring and shoe. The focuser itself is very smooth and very solid. 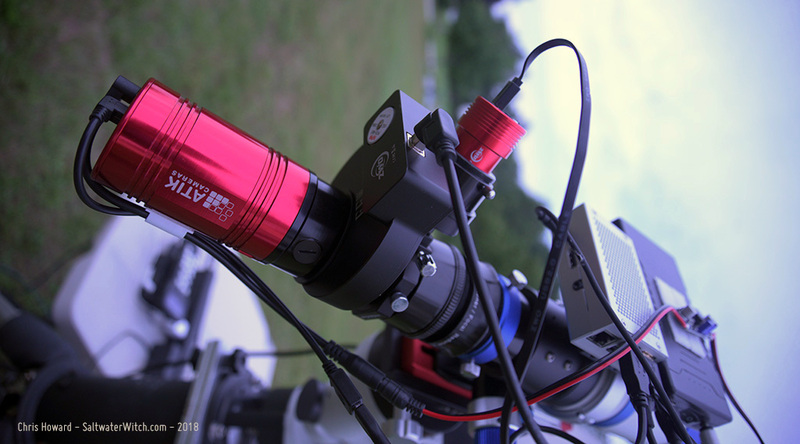 It’s a dual-speed rack-and-pinion type, and so you may want to adjust some of the tension screws depending on the load you’re planning to add--a DSLR or more, but out of the box, this focuser along with FPL-53 glass makes this scope worth considering for your wider-field work. To remove that flexure in the system, I bought a ZWO 78mm Holder Ring for ASI Cooled Cameras to see if it would work. The tube’s diameter is around 76mm, and with a delrin shim or something similar, the 78mm inside diameter of the ZWO ring worked almost perfectly. The one gap--literally--was with the two shoes of each ring. The stock William Optics one is ¼” (6.35mm) taller than the ZWO ring. Easy solution: I went to my favorite aluminum supplier (you have one, right? 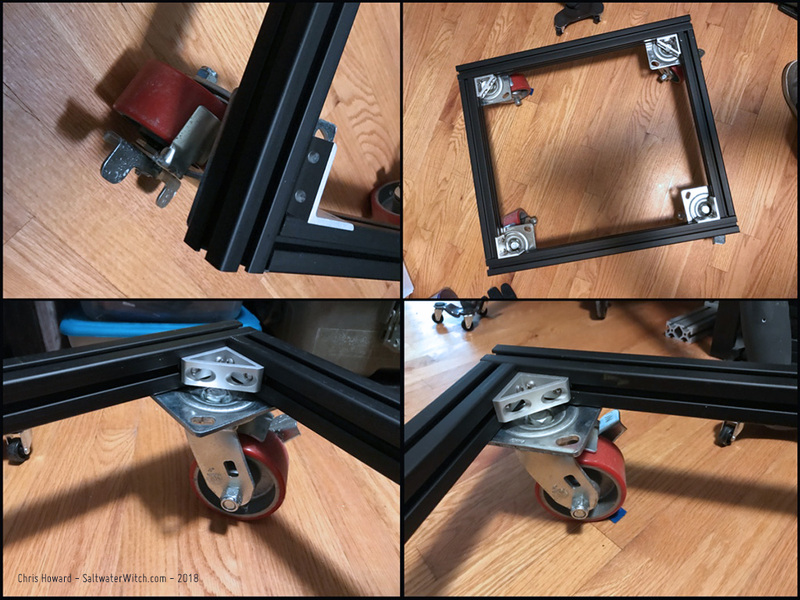 See the links below) and bought a set of stock aluminum pieces, 2” x 3” x ¼”, then drilled, and stacked it with the dual ring setup. Now the whole system is perfectly rigid with two strong foundations. The other advantage of going with the ZWO holder ring are the risers with the threaded holes on the top and bottom. 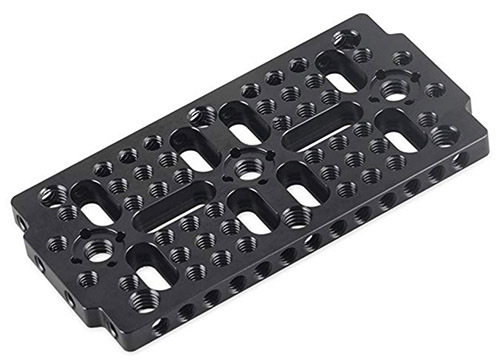 I added one of these SmallRig cheese grater mounting plates on the top--you should always have one or two of these on hand for bolting things together. They’re tough, anodized aluminum, and full of threaded holes of varying sizes. I use these on the ZS61 and my William Optics GT81 to connect the control hardware and power--usually a Raspberry Pi3b and 12v battery pack. What’s nice is I can use a couple hexcap screws to quickly add or remove all devices from one scope to the other. So, there you have it. 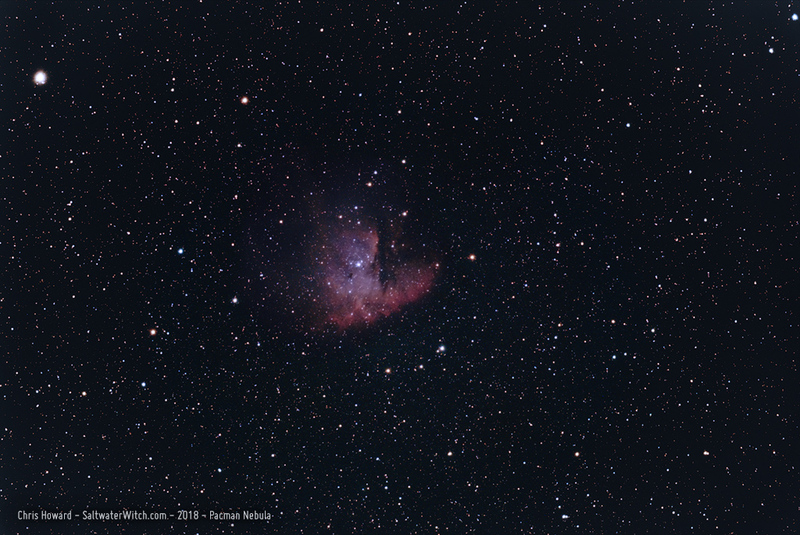 An easy way to build more rigidity into a nearly perfect portable wide-field setup. Let me know if you have questions, or a better way to accomplish this. I added some links below for the components I used. What changed? 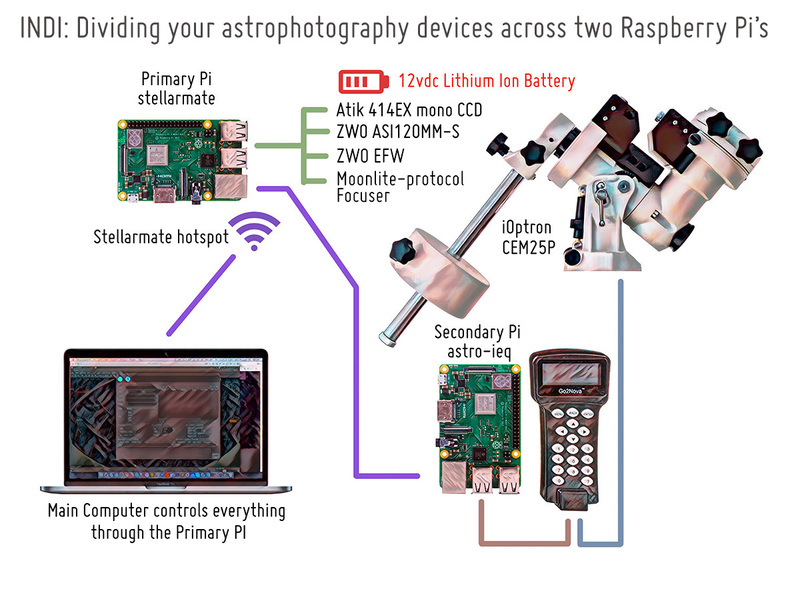 I’ve been looking at the StellarMate gadget for a while now, and Jasem’s presentation on the Astro Imaging Channel (https://youtu.be/XkgwY_KsBjc) tipped me toward checking it out. He did a great overview of single-board computers in astro automation, with particular focus on Raspberry Pi's and the Atom-based Windows machines that have become popular. My goals with astrophotography have also changed over the last couple years; I've been moving more toward portability and automation, minimizing setup time, and using smaller refractors and lightweight but accurate EQ mounts. (Another general reason to go with StellarMate OS is it works great with the faster Rasp Pi 3B+. 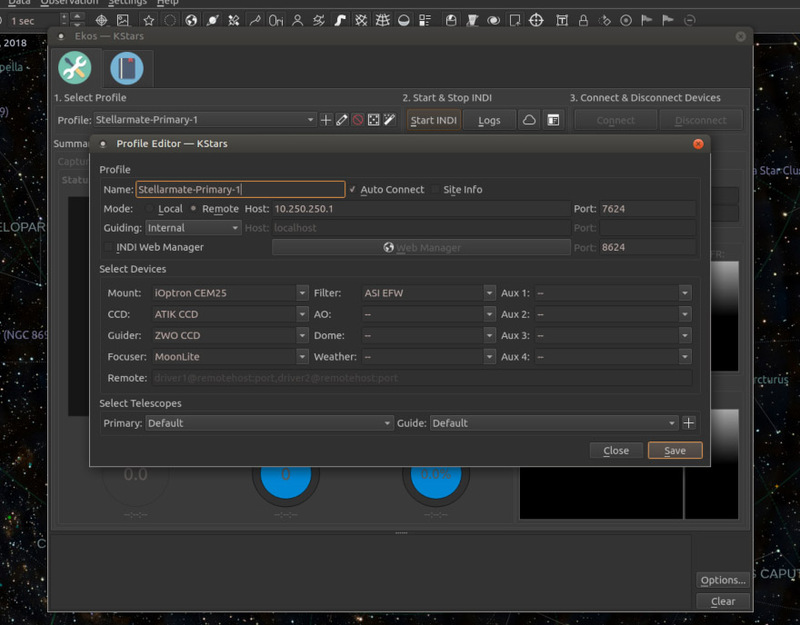 Just purchase the OS on stellarmate.com, download, flash an SD card, and you’re good to go). I don't think you need to sudo these commands, but I did in my tests. The "iEQ" designates the device ID for the iOptron CEM25 series of mounts. This parameter "iEQ"@astro-ieq:7624 tells the INDI server to connect to the "iEQ" device (iOptron mount) on astro-ieq (the secondary pi) through port 7624 (default INDI port). The tip from Jasem's tutorial (link above) on chaining multiple Raspberry Pi's together is to run indiserver -m 100 -vv indi_ieq_telescope first to get the verbose output and grab the device IDs. That's how I found the ID "iEQ", which works for several iOptron mounts, including the CEM25P and iEQ30. Here are three shots of my working multi-node setup, showing the primary Pi (running StellarMate OS). 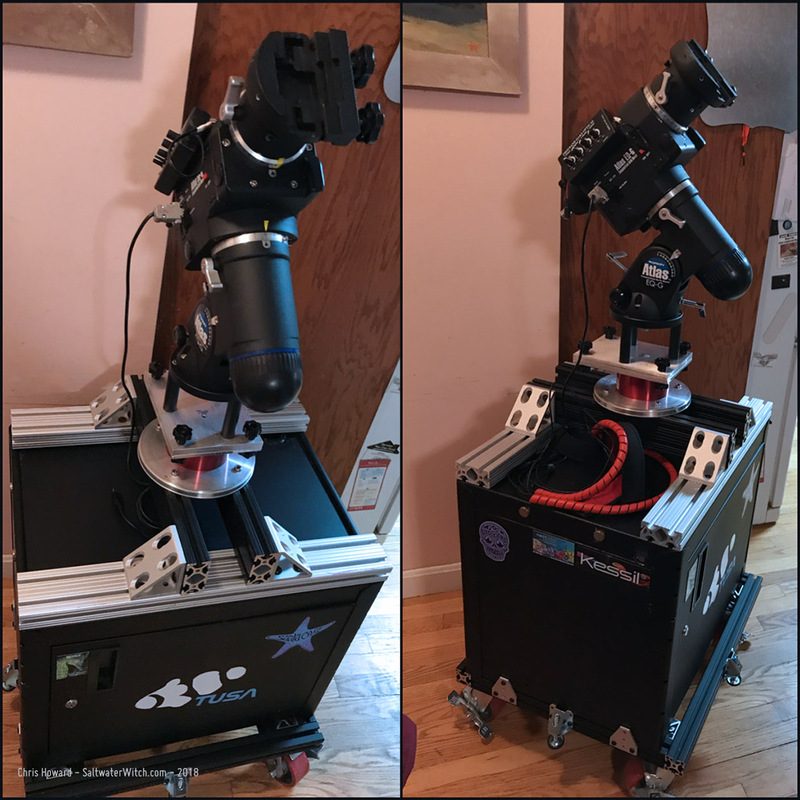 The aluminum box on the top is a Raspberry Pi 3B+, with all four telescope-mounted components plugged in: Atik 414EX mono CCD, ZWO filter wheel, ZWO ASI120MM mini guide camera, and Moonlite-protocol focuser (not in view, other side of the scope. This is a new DIY focuser and controller I'm also testing out, which uses an Arduino Nano, 28BYJ-48 stepper motor, and ULN2003 motor driver board). The black box beneath the Raspberry Pi is a 6000mAh Li-ion battery with 12vdc out (https://www.amazon.com/dp/B00ME3ZH7C), along with a 5vdc USB power port. I run the Pi off the USB port, and the Atik camera off the 12v line, with a step up (boost) converter between to make sure we keep a steady 12v. You see that cable hanging down by the camera? That's the power line. I disconnected it before I took the pics because I'm measuring the boost converter for a 3d-printed case. For the system test I just velcro'd the PC board to the battery pack. 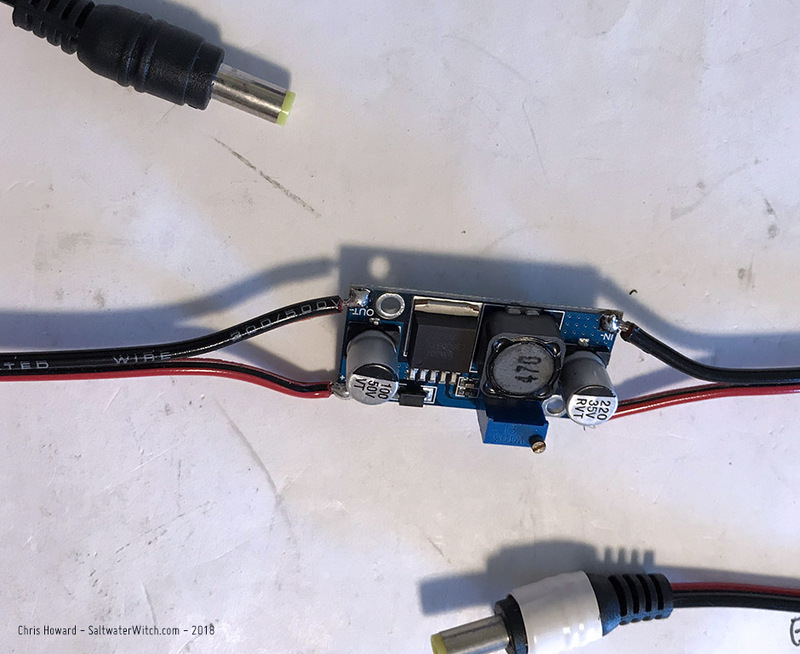 Close-up of the boost converter I used my testing so far, the XL6009 DC-DC step-up power converter https://www.amazon.com/dp/B06XWSV89D. I put this inline between the battery and the camera's 12v connector. 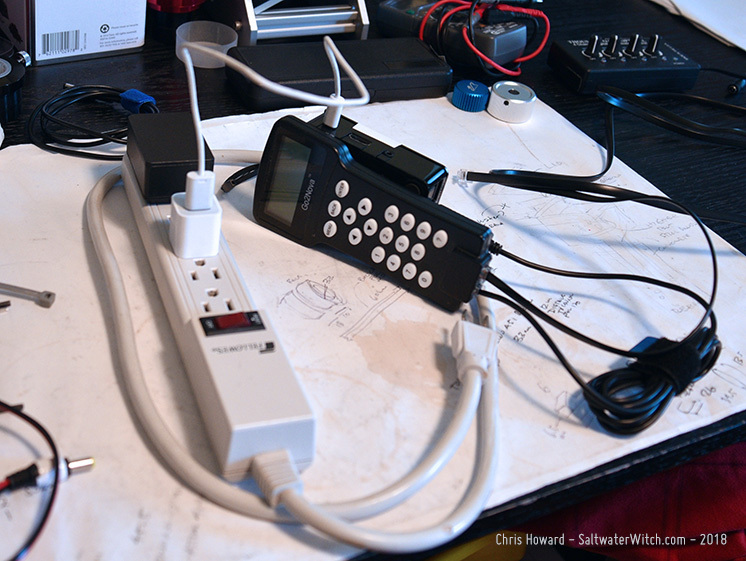 The problem I'm solving is the battery pack will drop voltage over time as the batteries discharge, and I'm willing to trade-off amperage in order to keep the voltage stable at 12v along that curve. Again, this is a test, so we'll see how this works out. My concern with real-world use is how much the camera draws for TEC (thermoelectric cooling) when I'm maintaining a sensor temperature at -20C? I still have to figure this out and see what I need to do for power to support this. 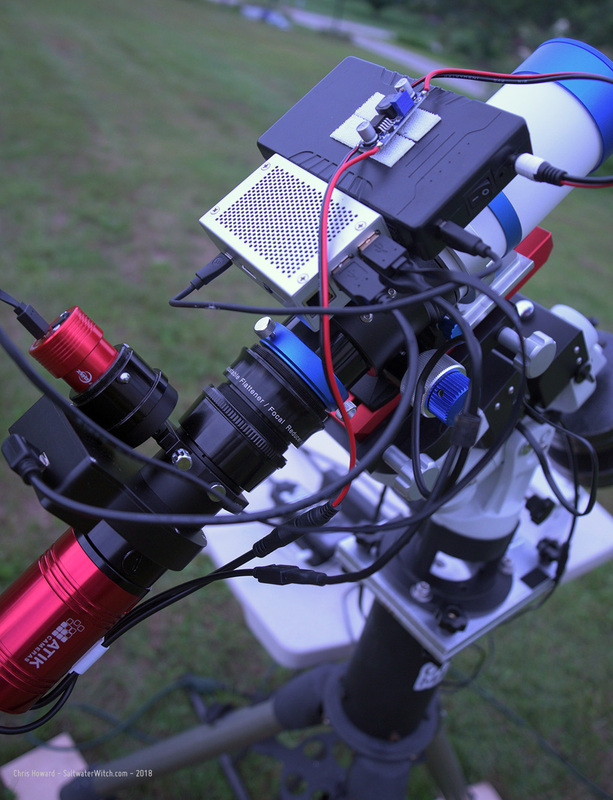 Another shot (from the top) showing the Pi running Stellarmate, with the four telescope-mounted devices using all the USB ports. 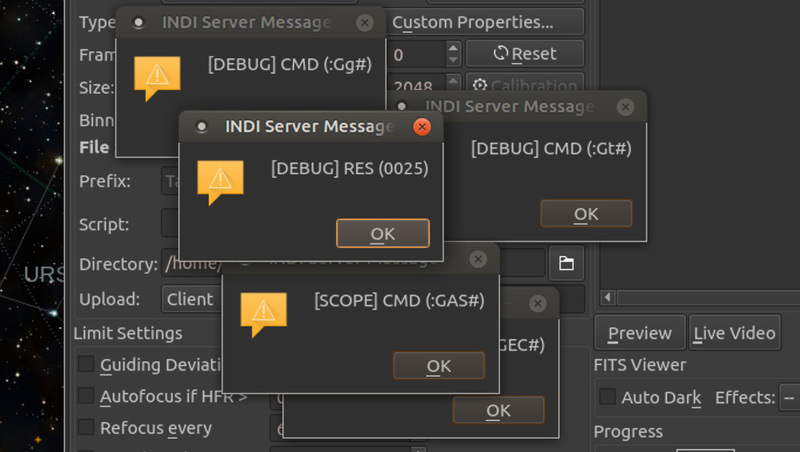 Here's a tip for you: if you're not actually doing any debugging, turn off debug on the Options tab in the INDI control panel for all your devices or you’re going to see a bunch of dialogues with commands sent to devices, status codes, and other fun stuff.